MS Dhoni and Sakshi are a well know cricketing couple in India. Recently Sakshi celebrated her 30th birthday with family and friends in Mumbai. Indian cricketers Hardik Pandya and Robin Uthappa were also present in the party. MS Dhoni and Sakshi started dating in 2008 and tied the knot in 2010. 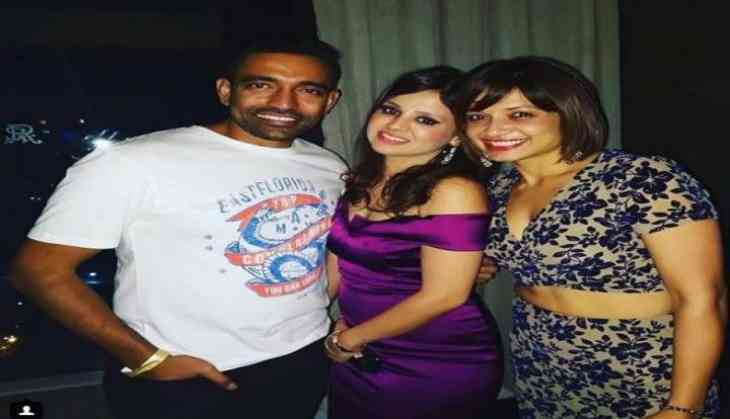 After Sakshi celebrated her birthday, she took to instagram to share a photo with Robin Uthappa and his wife Sheethal and wrote, "Thanks to this man here Mahi and I are together". Sakshi also cleared a long time rumour of she knowing Dhoni since childhood. She said, "Just to clear out to people Mahi and I are not childhood friends and the first time I stepped into Ranchi was after marriage". Robin Uthappa was part of the 2007 T20 World Cup winning team in which he played a very important part in India' win. The 33-year-old was also an important member of Kolkata Knight Riders in the Indian Premiere League. Dhoni is on break after he was left out of the ongoing T20I series against Australia. Thanks to this man here Mahi n i r together ❤️!!! It was great meeting u Robbie and Sheethal ... Thank u guys for coming and lot’s of cuddles to the lil one ! And Sheethal you looking HoT as ever! 😘 and just to clear out to people mahi n r not childhood friends n first time i stepped into Ranchi after marriage !